St. Mary is proud to offer all parishioners a chance to honor Our Lord through exposition of the Blessed Sacrament every week. Time: Come spend an hour with Our Savior in the chapel. 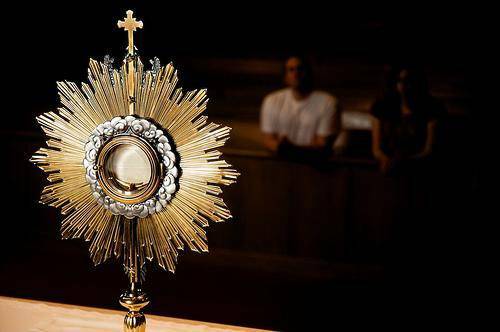 Adoration begins following the 9am Mass on Thursdays and ends before the 9am Mass on Fridays. We extend the hours for first Fridays of the month until Saturday at 9am. During lent, adoration continues until Stations of the Cross on Fridays at 7pm. Why do we not take more advantage of this inestimable gift? Could it be that our faith is weak? Do we not believe that he hears us when we talk to him, when we share our lives with him? Let us work to strengthen our faith during our time at adoration. May it be so in and through us. Let it begin with me.